The Backstage Bag, developed with Balmain’s backstage stylists, is especially created to carry all bare essentials of the session stylist! The bag features several compartments, including two heat resistent pockets. For example to hold the Balmain Professional Straightener/Curler, even while it is still hot. The transparent pockets on the outside easily hold different Care & Styling products and allow for easy identification. All compartments are fastened with snaps in order to transport hair additions and extensions without the risk of getting tangled. 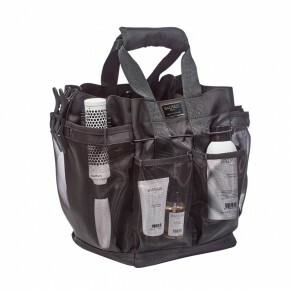 Includes a metal buckle that perfectly holds a session towel or any other accessory.